Barry Geraghty punches the air in delight after Buveur D'Air's victory in the Champion Hurdle. Buveur D’Air had to show courage to go with his undoubted class to successfully defend his crown in the Unibet Champion Hurdle. Nicky Henderson’s decision to abort a novice chase campaign to revert to the smaller obstacles paid off spectacularly when he lifted the two-mile hurdling crown last March and having won each of his previous three starts this season with the minimum of fuss, he was the 4-6 favourite to become the first horse to win back-to-back renewals of the race since Hardy Eustace in 2005. With his stable companion Charli Parcs ensuring a sound gallop alongside the 2015 champion Faugheen, Buveur D’Air was given a nice lead into the race and although his jumping was not as sure-footed as usual, he arrived on the scene travelling powerfully after jumping the second flight from the finish. With Faugheen weakening out of contention, it was stablemate Melon who gave Buveur D’Air a real battle racing up the famous hill, but Henderson’s charge dug deep for Barry Geraghty to prevail by a neck. Henderson, saddling his seventh Champion Hurdle winner, said: “It was a good race, a proper race. It’s the first time he has had a race all season (after three easy wins) and that did worry me, I must admit. Despite Melon’s narrow reverse, it was another fine day at Prestbury Park for trainer Willie Mullins, the Irish champion trainer saddling three winners on the card. Footpad (5-6 favourite) extended his unbeaten record over fences to four with a brilliant display in the Racing Post Arkle Trophy under a jubilant Ruby Walsh. 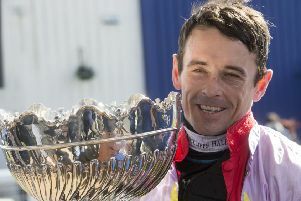 Walsh, who only last week returned to action having been sidelined since suffering a broken leg in November, said: “It sent the hairs down the back of my neck. Benie Des Dieux (9-2) provided Mullins with his ninth victory in 11 years in the OLBG Mares’ Hurdle under an inspired Walsh ride and Rathvinden (9-2) completed the hat-trick in the hands of the trainer’s son, Patrick, in the National Hunt Chase. The Nick Williams-trained Coo Star Sivola (5-1 favourite) clung on grimly to provide jockey Lizzie Kelly with her first Festival success in the Ultima Handicap Chase. The concluding Close Brothers Novices’ Handicap Chase went to Mick Channon’s 13-2 shot Mister Whitaker, ridden by Brian Hughes.